No King Dragon offer for me, and I don't have one in my garage. Got the Kaiju offer though. Unfortunately there doesn't seem to be an identifiable pattern to when they show up. There was an offer for the Pz IV (?) a few weeks ago that I never saw. But does the hand of Mao guide it’s shells? I like mine. It's got the familiar feel of the T-54 chassis, a great but bit troll gun, and the right amount of gaudy design elements. 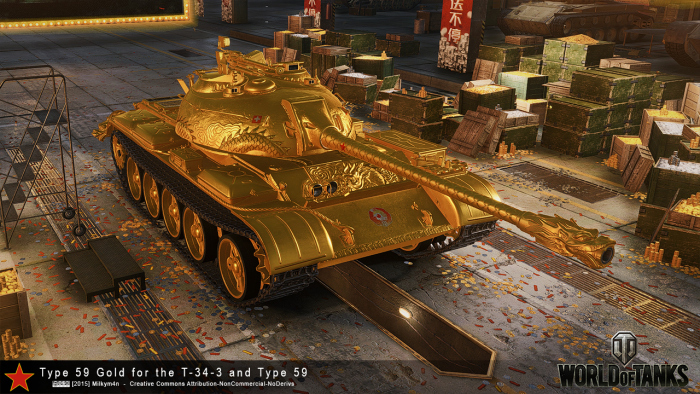 It's not super over the top like the shiny gold PC Type 59G. Depending on the lighting, the Chinese flag colors can be muted and somber or bright and fierce. And the dragons really pull it all together; breaking this tank out of the plain industrial design of other tanks to the level of art. Ugly? No. Have you seen these Mercenary tanks lately? It varies, game by game, kind of like the Soviets. Sometimes mine refuses to hit. The other day i penned a hull down T32 at mid range through the hatch 4 times in a row. I finally got the offer, now I'm going to have to decide if I want to buy it. I already have the Type 59, and the other three Chinese tier 8 tanks. 6 Chinese premiums in all. Is it really worth it or wait to see what is offered next week? I was glad to get the same. I also got the STRV flag TD on offer. After breaking my no spend rule on war chests, I ended up with 18000 gold to buy the two personal offers. Not that I'm encouraging the gamble aspect of the chests, but ended up with the Patriot and Defender from the chests. Spent $60 and have 4 tier 8 premium tanks I wouldn't have had otherwise. lol art??? Can’t say I’ve had that much Koolaid. I love the tank but it is gaudy as all getout. I guess it’s like an adorable but ugly as hell dog for me. I just go with the aesthetic and say it fires McNuggets, with premium ammo being Chicken Selects, and the tank commander is Mayor McCheese. Works for me. Edited by RFCAN76, 24 January 2019 - 03:44 PM. If you don't mind the coloring of Motherland or Fatherland, you could put up with King Dragon's outlook. Surely you don't see its over all color and body line while you are fighting in it, only enemy tanks' players do see its full red color. Edited by salomon2007, 23 January 2019 - 05:27 PM. What a hideous tank. Why does WG think tanks designed like are “cool”?. I hardly doubt that the kids think it’s “cool”. I bought mine that way. The personal offer from the Tiger 131 was a couple months ago. Got the offer today and decided that I do need the McDragon in my garage.